Rarely has a cookbook stained faster in my kitchen than this one. I have been waiting for Rachel Roddy’s first book ever since I was able to take a quick glance at it last summer, in a hurry, in a bookstore in London. When “My Kitchen in Rome” finally arrived, I tore into it on the same day with a hunger that surprised me. 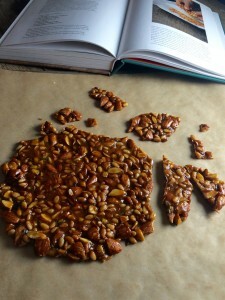 Within days I was cooking from it, starting with sugary brittle of all things. Normally, eagerly awaited books will sit on my bookshelf for weeks, sometimes months. I have the curious habit of stashing away books I love. Maybe I believe books ripen on my shelves, like wine or cheese. I do the same with gift packages on my birthday, or at Christmas. The more precious I expect the content to be, the longer I circle around it. So if I get to a book years after everyone else has discovered it, read it, and raved about it, well, that’s just me. Rachel’s book broke all these rules. You will understand why when you add it to your collection. I can’t imagine anyone resisting its appeal—Rachel’s prose, her cooking, her photography. Admittedly, I’m biased. I have been a fan of her blog for years. And we both share a love for the simplicity of Mediterranean food. And for honest home cooking. Still, this book brings it all together in one smashing package. My Kitchen in Rome emits such an unbridled love for adventures and explorations of Italian cooking that it makes you want to move to Rome tomorrow, Rachel’s adopted home city, where she is raising a small son with her man Vincenzo. And then there are the images—of visits to the butcher, the fish monger, and the vegetable markets of her Testaccio neighborhood in Rome, of her dinners and lunches, and her now famous kitchen sink, the center of her Instagram life. I consider Rachel’s pictures among the finest in food at the moment. She is one of the few people who can make everyday shopping, dirty dishes, empty dinner plates look flat-out glamorous. You just want to be there, at her table, in her unadorned kitchen when she washes mountains of greens, two dozen artichokes, and pounds and pounds of peaches. If you’d see similar pictures from my kitchen on a busy workday, you might want to turn your phone off. Rachel’s images on the other hand come across as real without being a let-down. In short, Rachel has an artist’s eye and writes with the pen of a poet. No wonder her book won the Andrew Simon Memorial Fund best food book this year in the UK. So be sure to follow her everywhere, on Instagram, on her blog, and in the Guardian newspaper where she now has her own column. It is umbrella or stone pines that produce the pine nuts known as pinoli, slender, resinous things that are incomparable in pesto. I hadn’t made the connection until one day I saw three small boys smashing open the tiny nuts they had collected with a stone and then either eating or flicking them into their companions’ faces. Unless you are tenacious and patient enough to do what the three little boys did, it is nearly as hard to find Italian pine nuts in Rome as it is in London. But when you do, a handful of them work beautifully… . Rachel calls her recipe an “informal caramel” for her “thermometer-less kitchen”. It is her practical day-to-day approach to cooking that invites you to be fearless at the stove. This is what a good cookbook should do. I added weight measures in case you prefer to use a scale. 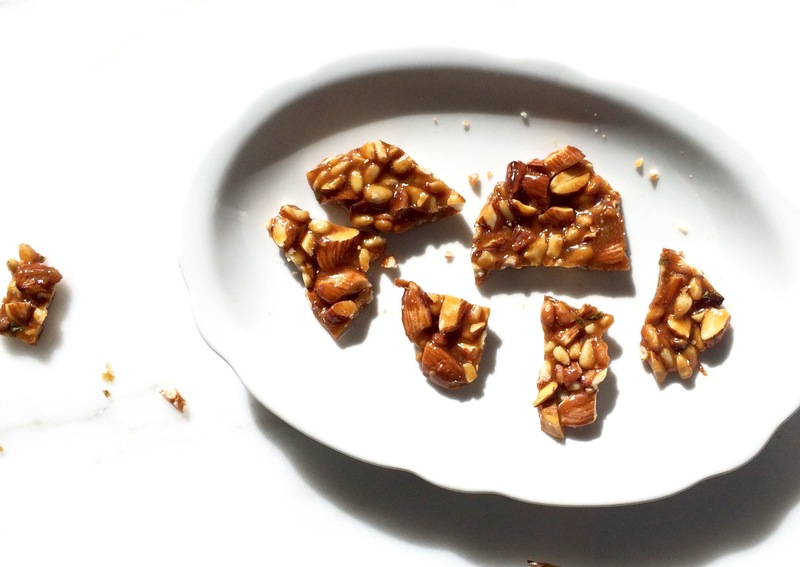 A note: I had some brittle yesterday, a good week after I prepared it, and it has become even finer—as the rosemary had time to infuse the brittle throughout. So if you can, double the recipe and stash some away in a container with a tight-fitting lid for later. Heat a heavy-bottomed pan (stainless steel is ideal) over medium-low heat for 1 minute, then add the sugar and leave it, not touching it at all but keeping an eye on it. Shake the pan occasionally once the sugar starts to turn liquid. While the sugar is melting, pick the rosemary leaves and chop them roughly (I ended up with 1 teaspoon winter rosemary from my own bush which was perfect). Put them in a bowl with the chopped almonds, salt, pine nuts, and baking powder and stir well to combine, making sure there are no lumps of baking powder. As soon as the sugar has turned a dark caramel color, add the butter carefully, stirring with a whisk or heatproof spatula, then add the almond mixture and mix to combine. Turn off the heat. Turn the hot brittle mixture quickly and evenly onto a nonstick silicone baking mat or large piece of oiled parchment paper placed on a heatproof surface, and use a spoon dipped in hot water (I use my hands dipped in cold water) to spread it out if needed as it starts to cool. Leave to cool completely. Once cooled, break it into large pieces and store between layers of wax paper in an airtight container. Excerpted from MY KITCHEN IN ROME by Rachel Roddy. Copyright © 2016 by Rachel Roddy. Used with permission of Grand Central Publishing. All rights reserved.